Harry Reid’s gambit to deny Republicans a 54th Senate seat. Elections have consequences, as President Obama said in his glory days, and barely a week later the losing Senate Democrats have already broken their line against the Keystone XL pipeline. Call it the Save Mary Landrieu Act of 2014. The Louisiana Democrat faces a Senate runoff next month against Republican Rep. Bill Cassidy, and, lo, Majority Leader Harry Reid has suddenly allowed a vote on legislation she proposed with North Dakota Republican John Hoeven earlier this year that Mr. Reid blocked. The idea is to give her a show of political independence from Mr. Obama, who is about as popular in the Pelican State as BP . You have to admire this transparent show of low political principle, especially because it clearly betrays that Mr. Reid has been the real obstacle to passing pro-growth, bipartisan legislation for the last four years. 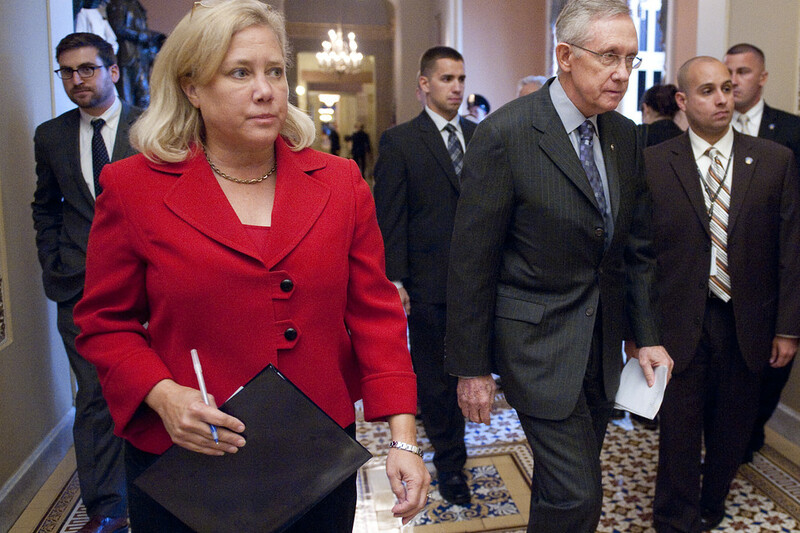 Ms. Landrieu couldn’t get Harry to move for ages, but now that Republicans will soon take charge her comrades will do anything to prevent the GOP from getting a 54th Senate seat. The House has already voted eight times to authorize building the Keystone XL, which would open a new avenue for crude oil from Canada and the Bakken Shale formation in North Dakota to refineries on the Gulf of Mexico coast. The House plans to vote again on Friday to pass the latest version sponsored by Mr. Cassidy, which is roughly the same as the Senate bill. President Obama has refused for six years to sign off on the pipeline, which his own State Department has estimated would create some 42,100 jobs and concluded would not significantly increase carbon emissions. State has completed five environmental reports confirming the null carbon hypothesis. If Keystone isn’t built, oil producers will employ other vehicles to transport Canadian crude. Cenovus Energy plans to export 375,000 barrels a day to Canada’s east and west coasts via other pipelines. Canadian Pacific Railway estimates that it will carry 200,000 carloads of crude next year, more than double last year’s load. Valero Energy is expanding rail terminals in California, Louisiana and Quebec to handle more oil shipments. One irony is that rail poses a greater environmental risk and so-called carbon footprint than the 1,200-mile underground pipeline. According to a State Department report this year, distributing the oil via train directly to the Gulf of Mexico would increase greenhouse gas emissions by 41.8%. But if this debate were about the merits, Keystone XL would have been approved years ago. The pipeline is really about Democratic fealty to the party’s rich environmentalist donors, and that means the bill still has to get past Mr. Obama. “It’s fair to say that our dim view of these kinds of [legislative] proposals has not changed,” said White House press secretary Josh Earnest this week. “The President’s senior advisers at the White House would recommend that he veto legislation” resembling prior House bills. So even if Ms. Landrieu gets her vote, Democrats can whisper to billionaire donor Tom Steyer that they know Keystone won’t become law on their watch. Republicans will have to do all of this again next year, when Ms. Landrieu’s support won’t matter. Louisiana voters should act accordingly. I'm not sure why people have difficulty understanding that the air or gas in the gap between double glazing acts just like that in a planet's troposphere. The hotter pane of glass represents the surface and the colder pane the tropopause. Let's imagine that at the tropopause radiation to space can happen, rather like happens from the methane layer near the top of the nominal troposphere of Uranus. If the rest of the troposphere (or the gap) were totally dry air (or some non-radiating gas like argon) then thermal energy would still transfer through the troposphere by (stationary) conduction and diffusion processes. But the process is slow. If we add water vapour (or carbon dioxide) then (as with moist air in the double glazing) the insulation effect is reduced because intermolecular radiation (and radiation direct to the tropopause or beyond) helps the thermal energy to leap frog (at the speed of light) over the slower moving energy going up by non-radiative processes. No thermal energy can be transferred back by radiation to lower, warmer regions. Yes the radiation can go downwards, but it is immediately re-emitted by electrons in any and all regions that are warmer than the source of the radiation. Its electro-magnetic energy is not converted to thermal energy and so it does not raise the temperature of whatever it strikes. The most prolific greenhouse gas, water vapour, cools rather than warms. Empirical evidence (using real world temperature and precipitation) proves this to be the case. The more water vapour you have, the more clouds there are shading the surface and reflecting energy back to space. The base temperature which the IPCC says is 255K is not that low, because they deducted 30% of the solar radiation supposedly reflected back to space by clouds which could not exist in the absence of water vapour on their imaginary Earth with no greenhouse gases. Using the correct radiative flux of about 341W/m^2 we get a temperature of 278K, not 255K. I'm hoping that even Australian politicians can understand this point. Once we have water vapour setting the radiative altitude at, say, 4.5Km, then, even if 98% of the atmosphere were then replaced with carbon dioxide, the radiating altitude could not rise above about 7Km in a troposphere only 11Km high. So this 2.5Km raising would be only 1 metre if only 1 molecule in 2,500 were carbon dioxide. And 1 metre represents only about 0.007 degree at the surface. There are other reasons why carbon dioxide cools more than this, but you can spend your billions and raise your concerns as much as you like about that 0.007 degree.